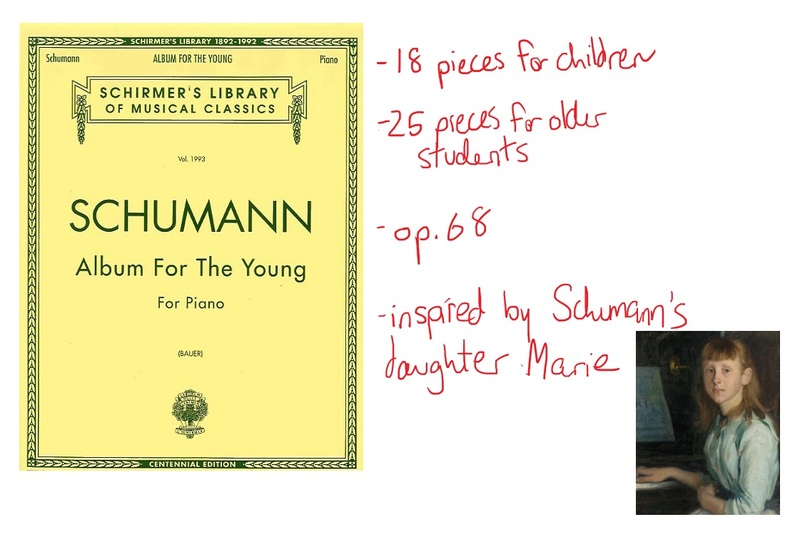 In today’s tutorial, we’re going to take a look at Album for the Young by Schumann, op. 68 no. 1 (Melodie). It’s an incredibly well-known collection of 43 short works, and has been around for over 150 years. We’re going to break down and work through the first, easiest piece – titled Melodie – to get you started with this very diverse collection. Schirmer’s Library of Musical Classics, Volume 2094. Composed by Robert Schumann. Piano Collection. Classical. Softcover. 96 pages. G. Schirmer #LB 2094. Published by G. Schirmer (HL.50490667). But first – backstory time. The first 18 pieces of this collection are written for children (or beginners), and the second part contains more difficult, more grown-up pieces. A lot of older intermediate students prefer to skip over this collection because of its title (Album for the Young), and because it’s intended to instruct the student. But I urge you not to pass over it! This collection is full of wonderful, colorful pieces, covering a huge spectrum of moods, tempos and styles. My favorite one is by Victor Merzhanov because of the detailed finger markings, which can be really helpful for non-advanced students. We’ll be taking a look at the very first piece in this collection, which also happens to be one of the easiest, at a grade 3 level (Henle 1/2). 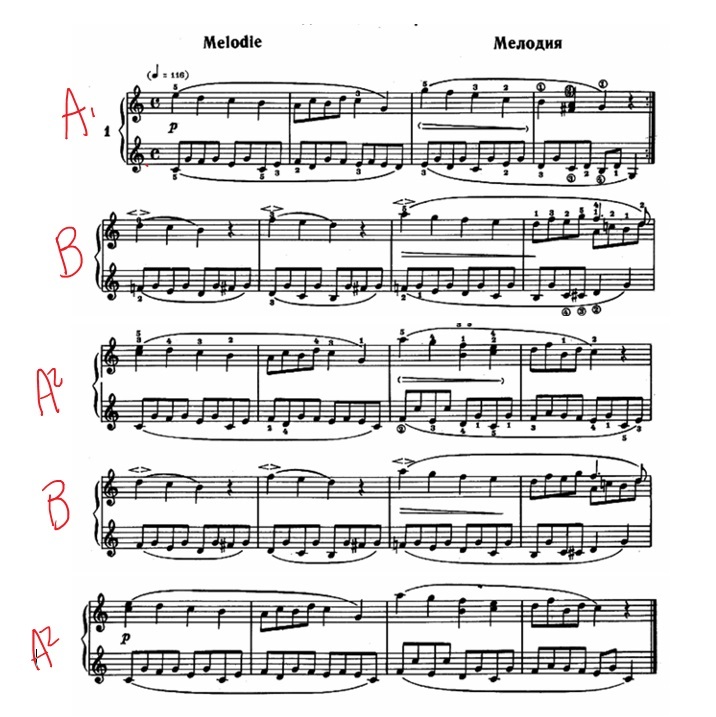 The album ranges in difficulty from Grade 3 to about Grade 7 (Henle 4), so some of the pieces are quite difficult if you’re just getting into intermediate music. Before we get into a discussion on beautiful phrasing, let’s look at some of the very basic details in this piece. First, the key, time signature and tempo. There are no flats or sharps in the key signature, which tells us that this is in the key of C major (which we can confirm by taking a look at the notes at the very beginning, which outline a C chord). The time signature is a big C, which just means “common time”. What’s the most common time? 4/4. And the tempo is laid out for us loud and clear – 116 BPM, which is moderate or even a little fast, allegretto. Next, let’s look at the format of the piece. I like doing this first to uncover any patterns, which will make the whole thing easier to learn and digest. Glancing through, you can see two distinct parts, which I’ll label A and B. Interestingly, the “A” sections change a little each time, so I’m going to label them “A1, A2 and A3”. The alternating section we’ll call “B”. These ones are very consistent with each other, so I’ll label them both as “B”. Finally, the last challenge I want to address before we get into phrasing is the left hand and right hand parts. They move in entirely different ways, which makes this a great piece for studying hand independence. The problem with playing this piece, and one of the reasons I think it’s a grade 3 piece (even though it doesn’t look overly complicated), is that the beautiful phrasing can disappear because of all the concentration put into keeping your hands moving independently. Only when your hands can comfortably be independent can this piece sing out the way it needs to. 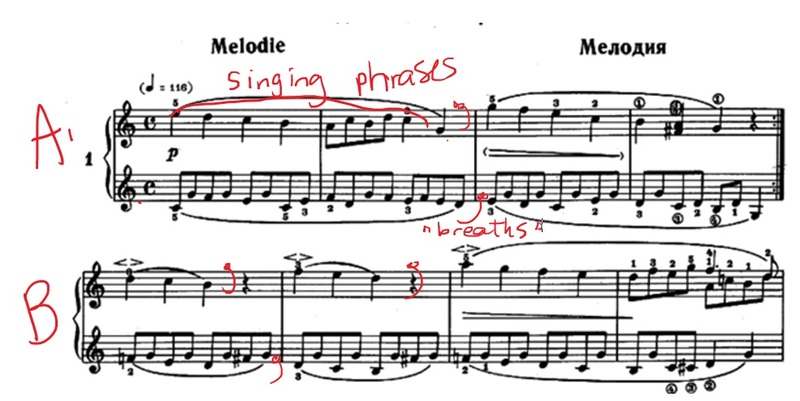 Phrasing, marked by slurs, is playing the notes in a way that you’d sing them. If you were a vocalist who was singing this, you would take a breath at a phrase break. And to make our piano playing sound natural and lifelike, we can do the same by lifting the key and creating a “breath”. Once you “breathe” the phrases, it’s important to also give them shape. Phrases aren’t meant to be played in a flat line, with every note at the same volume and intonation. Phrases are meant to breath. Again, using singing as an example, it sounds completely robotic to sing a phrase without any variation of tone or volume. The same is true on the piano. The title gives us a clue as to the lesson in this piece – “melodie”. What is a melody? A melody is the “tune” of a piece, or the part that you’d sing. So if “melodie” is the title, you know that Schumann wants us to play a beautifully-phrased, lifelike tune. So what hand is playing the melody? When I ask my students this, I also like to ask them, “What part would make the most sense to sing?” Usually that makes the answer obvious. Clearly it’s the right hand that’s the melody, since it’s moving in a way that would make sense to sing. While the left hand is still beautiful, it jumps around a lot more and doesn’t have a distinct “tune” of its own – it’s more outlining a broken chord pattern. So our right hand is the star of the piece, and the left hand is the supporting act. When we play this, then, it’s important that our left hand stay delegated to the supporting role, no matter how much it’ll want to come up in volume. We need to keep it to the background, so that the melody is able to float atop it. The best way to figure out the phrasing in this piece is to spend a little time playing hands separately, even once you know the piece quite well. When we play just the right hand, we can focus 100% on making it sing. When we add the left hand, our concentration will be a little more divided, so we need to make sure we put the sound of beautiful phrasing firmly in our ear, so we can hear it when playing hands together. Since putting this piece hands together can be a challenge, I suggest working with the natural phrases, in 2-bar sections. Any more than that and your memory will be stretched. If you work on putting together these small sections beautifully, you can then go in and stitch them together. I hope you enjoyed today’s tutorial! I’m excited to start getting into Schumann and other romantic composers, who tended to write very difficult music.